The awkward handshake. It happens all the time. From Snoop Dogg and Bill Mayer to Yao Ming and his whole family, it seems no one is immune. Even President Obama can't escape it. Why does something seemingly so simple feel so complex? You want to nail that interview? Have a good handshake. You want to show you belong in the room? Have a good handshake. You want to be King of the Jungle? Have a good handshake. 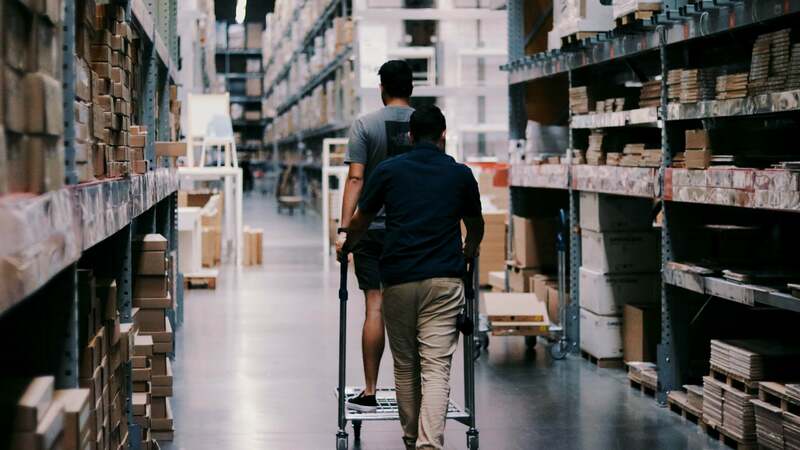 Today, the 'standard handshake' is usually reserved for more formal or business occasions but what are we supposed to do for all the other people we meet? What should we do when we meet someone for the first time that could be a potential friend someday? What should we do when we introduce ourselves to that girl or guy at the bar so we don't get come off as creepy? The greeting in each of these moments requires an understanding of multiple situational variables and if you miss one, cue awkward moment. The unfortunate reality is this awkward moment actually becomes an memory that leaves a lasting impact on how someone feels about you now and in the future. It doesn't seem fair for something that lasts shorter than a few seconds but I guess we've got to deal and figure this out. To understand why a handshake can be hard to get right, I thought I'd do some digging to learn about the origins of the handshake and its many variations on display today. If we understand the origins of certain handshakes, we may be able to at least prevent a few awkward greetings. Some researchers believe the handshake originated in the 5th century B.C. in Ancient Greece as a gesture to demonstrate peace. Back then, a handshake was used to show that no weapon was being held and the person you were greeting wasn't going to decapitate you. But over thousands of years, the handshake has evolved from being more than just about life and death — it's become a prominent gesture that represents trust and respect in important deals, meetings and agreements. The handshake is a powerful tool of judgment, arguably as important as any signal we could send to another human. A handshake, whether good or bad, also has a chemical impact, capable of leaving a long-term memory in your brain. When you complete a good handshake with someone, a hormone in your body called oxytocin is released, priming you to be more likely to trust the person who's hand you're shaking. Economist Paul Zak studied brain imaging and is credited with being the first person to find the role of oxytocin in facilitating trust in human bonding. 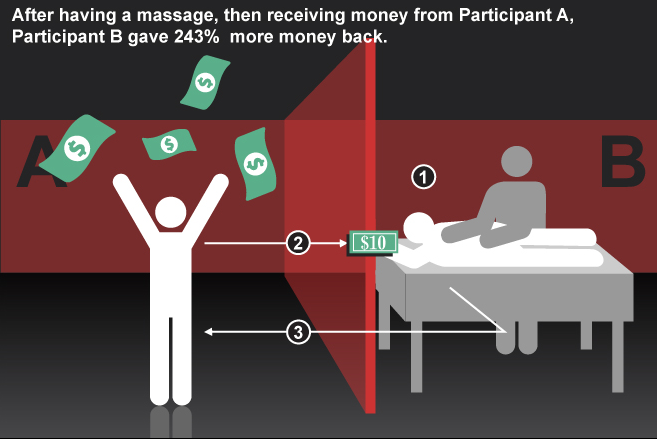 In his study, Zak designed a Trust Game, where one stranger would give money to another. Shortly after this exchange, the person who was given the money was then asked by a computer to reciprocate and give some money back. The more money the first person gave, the higher the oxytocin level was of the person receiving the money and the more money they gave back. Zak's research concluded the human brain unconsciously releases oxytocin to help people determine if someone is trustworthy based on our memory of past encounters and other senses, including touch. 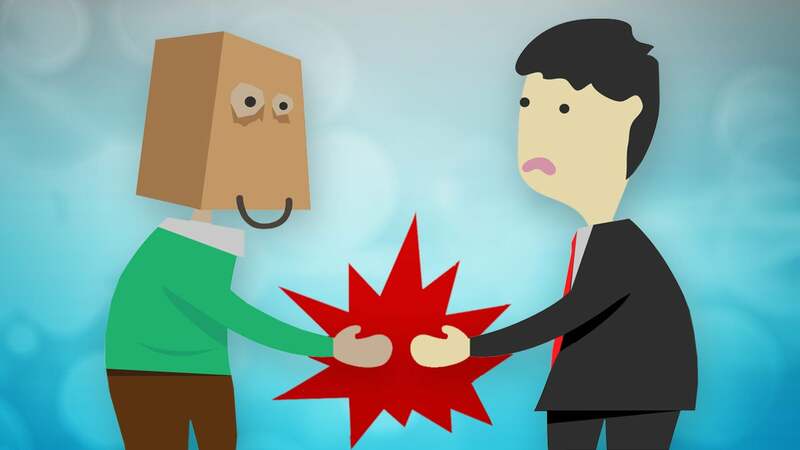 When a handshake falls apart for whatever reason, we remember it. The negative emotions associated with a failed greeting imprint themselves in the hippocampus and amygdala, the parts of your brain associated with memory and emotion. If so, you likely still remember the unpleasant awkwardness and who you shared this awkward greeting with. This storing of negative emotions is what helps us remember things that are bad (like touching a hot stove), so we don't have to re-learn them in order to avoid them in the future. Unfortunately, in the case of a handshake, these negative emotions become associated with the person you were greeting. Think about the thousands of people you meet and each time you shake hands; usually, this is the first time two humans touch… In an instant, we are making impressions that have a very long shelf live based on a brief but important handshake. As cultures evolve around the world, so to do greetings. Kissing has become a common greeting in cultures in Europe, while a short bow evolved as the greeting in Asia. To make things even more complicated, subcultures have further evolved greetings. The fist bump was believed to have started in the 1940s as a way for motorcyclists to greet each other at traffic lights. The fist bump then made its way into sports as an acceptable form of greeting between athletes in boxing and later on in baseball. As cultures mix and more subcultures form, it's becoming harder to know the proper greeting for each person you meet. If it's the first time you're meeting someone, you're likely left trying decipher the proper greeting based on the cultural background of someone you don't know — pretty much an impossible task. And yet, if a handshake is not performed correctly, a negative impression will leave an imprint on your mind for a long time. Most handshakes have deep cultural roots and it can be hard to get every greeting right. But knowing the origins of certain common handshakes may increase your odds of picking the right one. The fist bump may have started as a greeting between motorcyclists but today it is used heavily in sports and amongst close friends. When to use: The fist bump works best if you're congratulating a teammate while playing a sport or greeting a close friend. It is also a valid option for greeting someone who is visibly sick (i.e. coughing or says, "I'm sick!") to reduce the spread of germs. 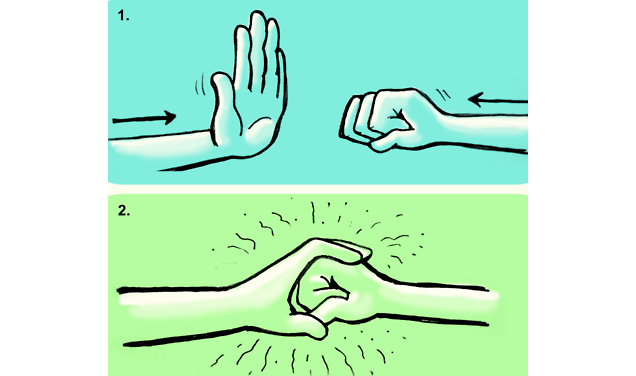 If you're going to go for the fist bump, approach with a closed fist immediately and from a distance (ideally 1-2 metres) so your fist can be picked up by the peripheral vision of the person you're greeting. The bro hug is typically used between two men to signify they're closer than a standard handshake. It is good to see you again, my friend; we know and like each other, but are not so intimate, nor have been apart so long, that a full hug is warranted. 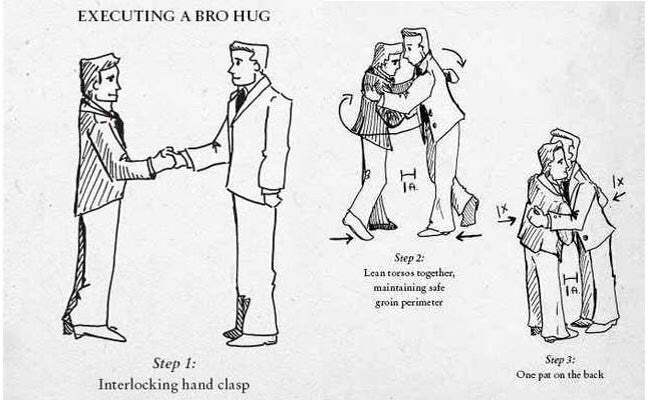 When to use: The bro hug is best reserved for use with close friends (and usually between men). It's appropriate in almost any setting (a night out, at the gym, or even at the office). 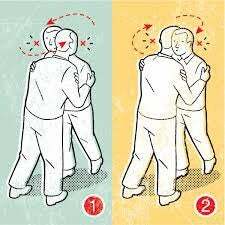 Good form entails an initial hand smack and clasp, followed by a full arm wrap around, and finishing off with a pat on the back. 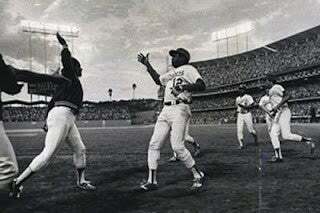 There are many theories about when the first high five was recorded but one of the most documented early occurrences was between two baseball teammates, Dusty Baker and Glenn Burke, of the Los Angeles Dodgers in 1977. The high five's heyday was the 1980s, but once the 1990s hit, it was viewed as a corny greeting (which is why a high five should never be used on a date). When to use: Today, the high five is typically reserved for celebration of a job well done, usually in a competitive event. It can also be used when you messed up and you're ironically telling yourself "job well done". Cheek kissing is a common greeting between a man and a woman in many parts of Europe and Latin America and a few places in North America — including Quebec, Louisiana and Florida. Cheek kissing is typically less common between men but more common between women and usually involves one, two, or three alternating kisses on each cheek, usually starting with the right cheek. In the United States, the cheek kiss is typically a single kiss. In Quebec, Canada, cheek kissing involves two kisses on each cheek. In certain parts of Europe, the number of kisses vary. When to use: Depending on if you're a guy or girl, cheek kissing can be tough to get right. For instance, I'm an American guy but I live in Quebec. I thus, default to the double kiss with all women and go with the standard handshake or bro hug (depending on level of closeness) for guys. Always start with the right cheek. If you're in the United States, go with one kiss. If you're in Quebec go for two kisses. And if you're in Europe, read this. Today, the standard handshake is typically reserved for business or formal situations. 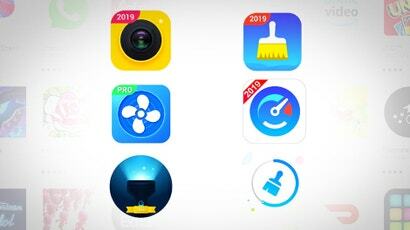 Common use cases include showing respect to a new business partner or greeting the parents of your boyfriend or girlfriend. It's also more likely for men to shake hands in non-business occasions than women. When to use: When in doubt, go with the standard handshake. At least you're showing you mean no harm and the worst that could happen is you come off a bit cold. But this is better than misreading a situation and going for one of the handshake variations above when the other person isn't ready for it. It's likely we won't be able to prevent all the awkward handshakes with a single article but if we can stop even a few from getting in the way of us feeling closer to one another, then we've probably at least done some good. I know. This is a lot to remember so to make things hopefully a bit easier, we also made a cool infographic at endawkwardhandshakes.com.